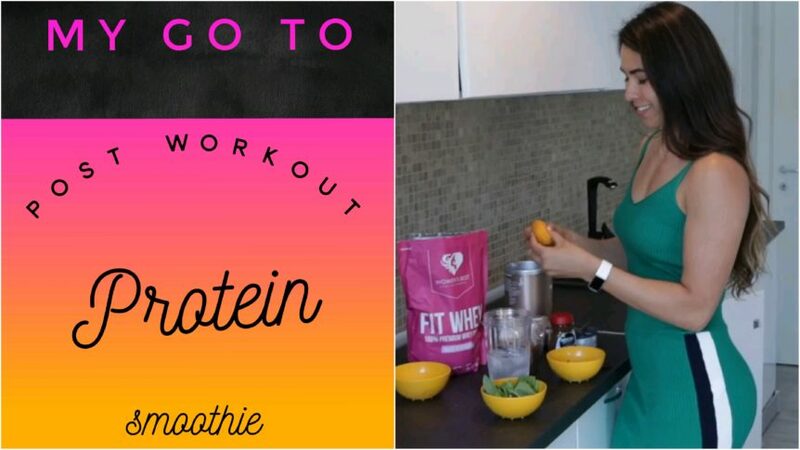 Try this thick and creamy post workout smoothie! I’ve been drinking this on repeat! Its only 281 calories! Throw everything in the blender and enjoy! This is perfect for when my sweet tooth kicks in. It tastes like melted coffee Häagen-Dazs ice cream which is my fav! Some of you are thinking “Ew, I’m not drinking a potato!” I feel ya, I thought this for a long time. BUT, I promise you it’s what makes this smoothie a meal for me. I’m usually a banana in my smoothie kinda gal but tbh, those never keep me full. Within 20 minutes i’m ready to eat again! Sweet potatoes are naturally sweet so there’s no need to add any sweetners to this smoothie. They are also a complex carb which provides you with steady, slow-burn energy. Adding them in has been a game changer because despite this smoothie being low in calories, they actually keep me feeling full for hours! I bake 4 sweet potatoes Sunday night and just peel them and blend right before blending. This is my fav way to prep them in general. 2. Use a fork to poke holes (4-5 times) all around the potato. 4. Bake at 400 F for 45+ minutes or until you can stick a fork in them with ease. This is my spin on @joseeksabs Mocha Protein Smoothie. Hi! Thanks for this recipe! I always have too much sweet potato at home and I don’t know what to do with it anymore! Approximately how many grams is one medium sweet potato? 🙂 thanks! I’ve been learning so much from your Instagram and website. Thank you for sharing all your wisdom. It’s really helped me learn to be okay with eating. I have a question about meal prepping. I’m going to be starting law school and I know I will have zero time to think about meals. What are some ways you plan your meals for the week before grocery shopping and meal prepping? I’ve heard in one of your Youtube videos that you use spreadsheets, but could you elaborate a little bit?